Give nothing. It’s the ultimate Secret Santa gift! It’s Secret Santa time. This year, don’t fret over a gift that your colleague may not like. Try something new. Buy a festive season card with a twist for just R35 and help feed a hungry tummy for an entire month! In return, you’ll receive a beautifully designed festive card to give to your colleague in place of a gift. It’s sure to leave both of you feeling good. Once you have made your donation an option of three cards will be emailed to you for easy download. The card will inform them that a donation has been made in their name to provide meals to hungry South Africans. 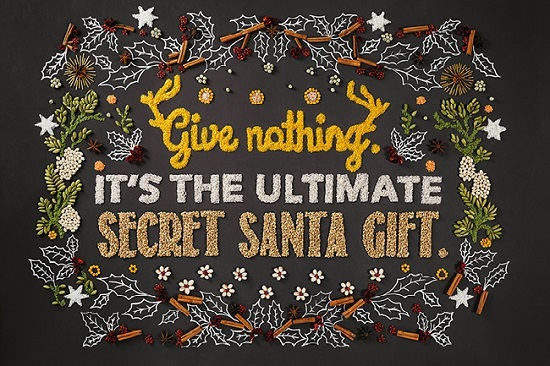 Click here to purchase your Secret Santa card!